The photographs below are larger than the usual ones on this site, up to c400k. Use of Automatic Image Resizing (in IE) will enable them to be viewed either in small or large format but transmission times will still be relatively long. The larger size is used to enable the members of the flocks and groups to be studied in more detail. 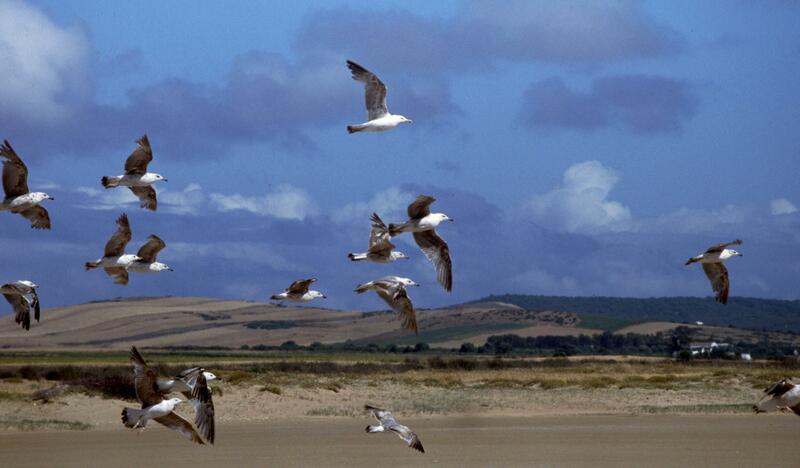 Identifying unusual gulls in flocks is of course the key to interesting gull identification. It is clearly possible to debate some of the assignments. It is more accurate to describe each assignment as 'showing the characteristics of ...'. The smaller birds seem more typical of intersection Atlantic-Med. populations rather than a purer atlantis as in the August 2001 example. 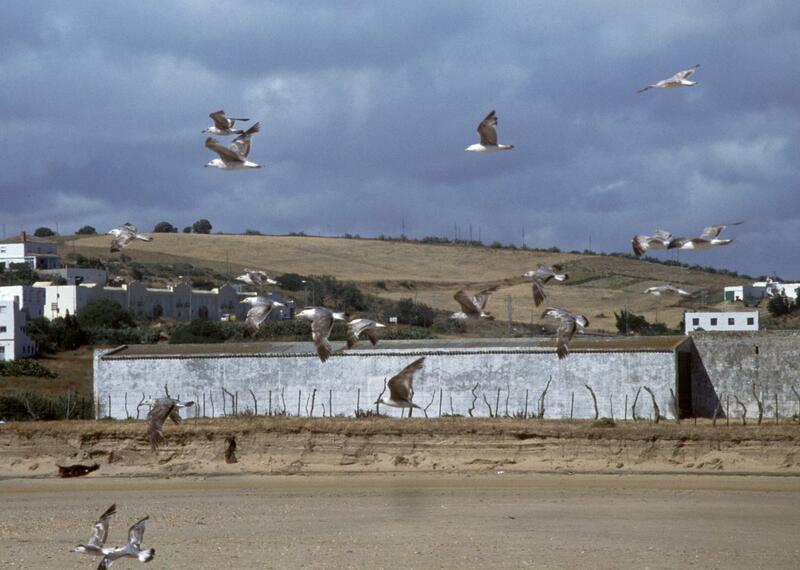 There is considerable overlap in the birds involved between the photographs. Putative totals are given below together with moult comparisons. Two Atlantic-Med. intersection 2s are on top and bottom of middle of picture. 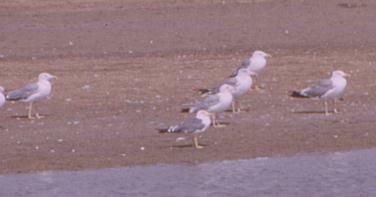 Note slimmer wings than michahellis, less bulky body, smaller head and bright yellow bill. Also on lower one there is an obvious dark blue-grey mantle. 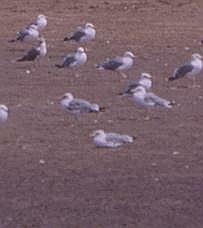 Audouin's Gull 1s is on top left. It shows a broadening secondary bar towards the primaries, all dark outer primaries and extensive dark on edge and terminus of tail, dark bill. Three Atlantic-Med. intersection 2s are in the centre together. They all show bright blue-grey backs and scapulars, smaller heads and chests. One more of this form is on the bottom left of the picture following the darker bird. One Atlantic-Med. intersection 1s is in flight against the white wall. This shows a dusky small head, is more lightweight generally and shows less contrast between back and wing. Some sparse mottling is shown on breast and belly. One Atlantic-Med. intersection 2s is sixth from left on ground under flying michahellis 2s. The legs are short (c70% of body above). The head is slightly boxy, the legs rather thin, the bill is thinnish and yellow with a red gonydeal spot. Legs are pale ochre and there is an obvious secondary bar. 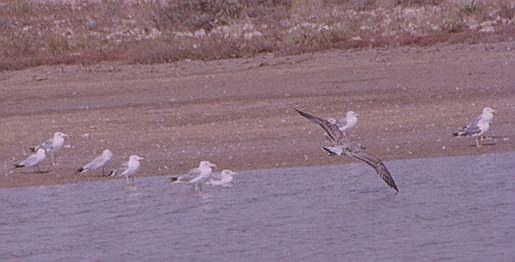 One LBB intermedius adult is on extreme left, the mantle is very dark, the head narrow and small, the legs short and both bill and legs have an orange tinge. It is clearly shorter-legged than the michahellis. 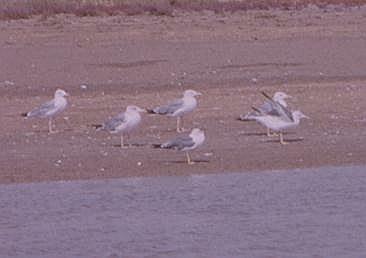 One Audouin's Gull 1s is towards the right (8th from right), looking very small against the michahellis and with relatively long dark fleshy legs. The michahellis have long legs (almost height of body above), boxy heads, heavy stubby bills, thick necks. Two Atlantic-Med. intersection 2s, one in flight at rear centre, the other 8th from the right. The one in flight shows a bright blue-grey back and scapulars, a broad tail band still, elegant narrow wings, small head, and a yellow bill to 3/4 from base. Another standing is quite lightweight with fine bill and thinnish short legs. A number of large michahellis are available for comparison. Two Atlantic-Med. intersection 2s are walking away on extreme left and right; trailing moulting feathers, bright blue grey back and scapulars, very pale on the coverts with feather loss, bright yellow-ochre legs in one, other quite pale pinky-yellow. Both short legs at around 60-65% of body above . One michahellis nearby (third from right) is 80%, other two are at wrong angle for measurement but long thigh bone obvious on one. Two other Atlantic-Med. intersection 2s are facing in middle (3rd and 4th from left). These also have short upper legs (above knee). Heads of all are slightly boxy suggesting that they are probably from intersection zone. Four Atlantic-Med. intersection 2s are, from left, 2nd, 3rd, 4th and 5th (latter at back). These show obvious blue-grey back and scapulars, bright ochre legs and relatively slight structure. 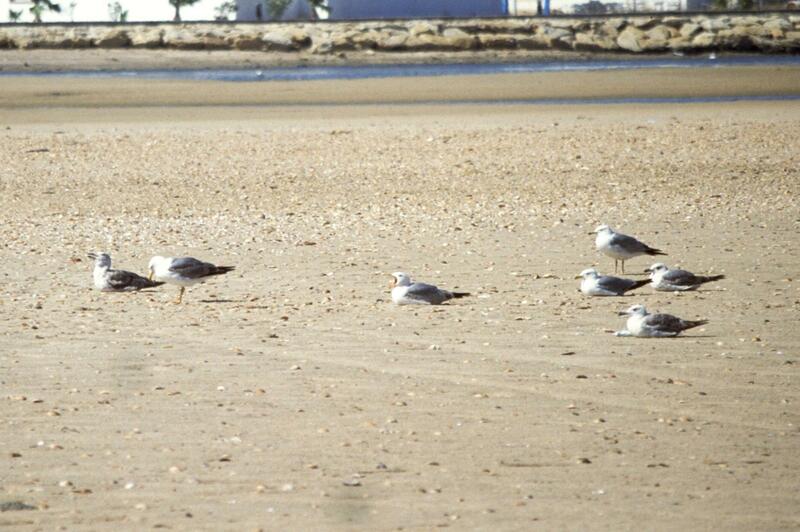 Legs are 70% of body on left bird and 50%+ (standing in soft sand) on right bird. The michahellis show massive long heads with heavy long bills and thick necks. Note total for Atlantic-Med. intersection is 5 compared to 33 for michahellis. Note later moult of Atlantic-Med. intersection 2s compared to michahellis 2s. (c) Copyright Nick Rossiter 2002.